We focus on whether prevention methods aimed at educating on the potential for drug abuse or treatment methods implemented after abuse will have a greater impact…The linear [computational] model assumes no social interaction, while both non-linear models do. Randall J. Swift and Stephen A. Wirkus. A course in ordinary differential equations. Chapman & Hall, 2007. Stephen Wirkus earned his Ph.D. in applied mathematics at Cornell University in 1999. After holding academic appointments at Cornell and Cal Poly Pomona, he went to Arizona State University in 2007 as a tenured Associate Professor and was named the 2013 Professor of the Year. Among Prof. Wirkus' scholarly interests are mathematical biology, differential equations, dynamical systems, mathematical methods in physics, mathematical modeling, and numerical methods. His interest in mathematical biology is evidenced by his current work focusing on mathematical models of diffusely interacting populations, the retina, and gene networks. Prf. Wirkus published the textbook A Course in Ordinary Differential Equations (Chapman & Hall/CRC Press, 2006), which incorporates the popular mathematical software MATLAB, Maple, and Mathematica, and is working on its second edition. 18. E. Camacho, C.Kribs-Zaleta, S.Wirkus, Metering Effects in Population Systems," Mathematical Biosciences and Engineering, forthcoming. 17. E. Camacho, S.Wirkus, “Tracing the Progression of Retinitis Pigmentosa via Photoreceptor Interactions," Journal of Theoretical Biology, 317: 105-118, 2013. 16. E. Camacho, S. Wirkus, P. Marshall, “Mathematical modeling of fungal infection in immune-compromised individuals: Implications for drug treatment," Journal of Theoretical Biology, 281(1): 9-17, 2011. 15. F. Berezovskaya, S. Wirkus, B. Song, C. Castillo-Chavez, “Dynamics of population communities with prey migrations and Allee effects: a bifurcation approach," Mathematical Medicine and Biology, 28(2): 129-152, 2011. 14. E. Camacho, M. Colon-Velez, D. Hernandez, U. Rodriguez-Bernier, J. van Laarhoven, S. Wirkus, “A Mathematical Model for Photoreceptor Interactions," Journal of Theoretical Biology, 267(4): 638-646, 2010. 13. N. Crisosto, C. Kribs-Zaleta, S. Wirkus, C. Castillo-Chavez, “Community Resilience in Collaborative Learning," Discrete and Continuous Dynamical Systems - Series B, 14(1): 17-40, 2010. 12. D. Daugherty, T. Roque-Urrea, J. Urrea-Roque, J. Troyer, S. Wirkus, M. Porter, “Mathematical Models of Bipolar Disorder," Communications in Nonlinear Science and Numerical Simulation, 14(7): 2897-2908, 2009. 11. S. Wirkus, M. Porter, “Comment on `Bifurcation analysis of parametrically excited bipolar disorder model'," Communications in Nonlinear Science and Numerical Simulation, 14(6): 2844, 2009. 10. F. Berezovskaya, E. Camacho, S. Wirkus, G. Karev, “Traveling Wave Solutions of Fitzhugh model with Cross-diffusion," Mathematical Biosciences and Engineering, 5(2): 239-260, 2008. 9. J. Abiva, E. Camacho, E. Joseph, A. Mikaelian, C. Rogers, J. Shelton, S. Wirkus, “Alcohol's E_ect on Neuron Firing," The Mathematical Scientist, 32(1): 32-40, 2007. 8. S. Wirkus, R. Swift, J. Switkes, “On Highway Relativity," The Mathematical Scientist, 31(2): 132-133, 2006. 7. S. Wirkus, “Approximating the Time Delay in Coupled van der Pol Oscillators with Delay Coupling," Stochastic Processes and Functional Analysis: a volume of recent advances in honor of MM Rao, Marcel Dekker, pp. 483-491, 2004. 6. J. Switkes, S. Wirkus, I. Mihaila, R. Swift, “On the Means of Deterministic and Stochastic Populations," The Mathematical Scientist, 28(2): 91-98, 2003. 5. R. Swift, J. Switkes, S. Wirkus, “Perceived Highway Speed," The Mathematical Scientist, 28(1): 28-36, 2003. 4. S. Wirkus, R. Rand, “The Dynamics of Two Coupled van der Pol Oscillators with Delay Coupling," Nonlinear Dynamics, 30(3): 205-221, 2002. 3. S. Wirkus, R. Rand, “Bifurcations in the Dynamics of Two Coupled van der Pol Oscillators with Delay Coupling," Proceedings of the DETC'99, ASME Design Engineering Technical Conferences, Sept 13-16, 1999, paper no. DETC99/VIB-8318. 2. S. Wirkus, R. Rand, A. Ruina, “How To Pump a Swing," College Mathematics Journal, 29(4): 266-275, 1998. 1. S. Wirkus, R. Rand, “Dynamics of Two Coupled van der Pol Oscillators with Delay Coupling," Proceedings of the DETC'97, ASME Design Engineering Technical Conferences, Sept 14-17, 1997, paper no. DETC97/VIB-4019. R. Swift, S. Wirkus, A Course in Ordinary Differential Equations, 2nd Edition, Chapman & Hall/CRC Press, Boca Raton, FL, 2013 (under contract). 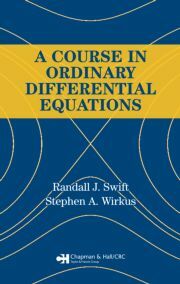 R. Swift, S. Wirkus, A Course in Ordinary Differential Equations, Chapman & Hall/CRC Press, Boca Raton, FL, 667 pages, 2006. R. Swift, S. Wirkus, Solutions Manual for A Course in Ordinary Differential Equations, 245 pages, Chapman & Hall/CRC Press, 2007. Stephen Wirkus is an Associate Professor of Mathematics at Arizona State University, where he was named a 2013 Professor of the Year. Among his scholarly interests are mathematical biology, differential equations, dynamical systems, mathematical methods in physics, mathematical modeling, and numerical methods.